Drive by Rhodes Hall, one of only a couple of what used to be hundreds of mansions lining Peachtree Street, and you'll see a sign in the front yard that reads "Castle for Rent." No, no, no...you can't move in. 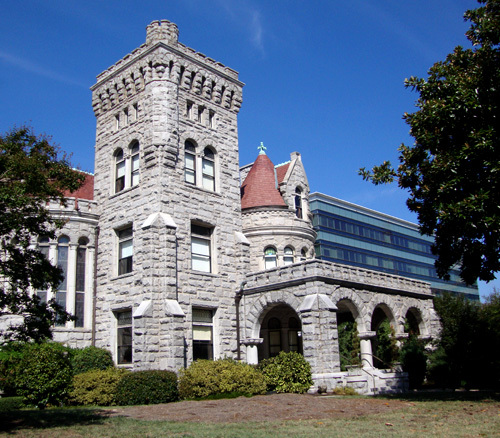 The Georgia Trust for Historic Preservation has their headquarters on the upper levels and the rest of the house is open for daily tours, but...you can rent the "Castle" for special events. This time of year, especially on a weekend afternoon or evening, you just might catch a wedding ceremony underway...and what an incredible backdrop--one of the most beautiful homes in Atlanta. The glass building you see on the right is the headquarters for Equifax, the largest credit bureau in the country. Founded in Atlanta in 1899 as Retail Credit Company by brothers, Guy and Cator Woolford, the company grew to become a world leader in the realm of modern credit reporting. Don't get too excited. Your credit records are not in this building. They're actually housed in another high-security facility further outside the city. ATLANTApix: Mickey is a Braves Fan! ATLANTApix: Happy 4th of July, America!